We lost a great husband, father and a respected economist. He also was a very faithful, warm-hearted, and amicable friend of all the members of KAEA and KEA. His academic contribution will last forever in the minds of many economists in the U.S. as well as in Korea. God bless Dr. Kwack and his family! 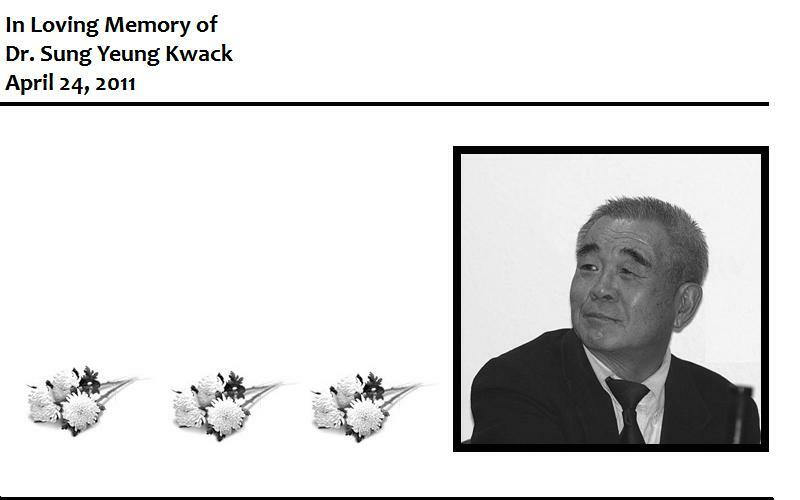 We are all saddended by a sudden and untimely losss of our dear & old friend, Professor Kwack. I personally owe him greatly for his encouragement and lead, as I started my career as a young economist in the early 70s. I will greatly miss his carefree smile, warm personality and friendship. At the same, I will cherish little time we spent together at various KAEA meetings. May God richly bless Mrs. Kwack and his two children. 선배님께 사고가 나기 며칠전부터 왠지 전화를 드려야겠다는 생각이 들었었습니다. 그런데도 전화를 드리지 못한건, 일년도 넘게 선배님한테 전화하지 않았다고 야단치실까봐 무서워서였습니다. 그래도 전화를 드렸었어야 하는건데. 너무나 후회가 됩니다. 수도없이 저한테 전화를 하셔서 한미경제학회를 걱정하시던 일이 아직도 생생한데, 선배님은 훌쩍 떠나가 버리셨네요. “어이, 닥터 황” 하고 부르시던 카랑카랑한 목소리. 한국경제에 도움이되는 연구를 해야한다고 야단치시던일, 이제는 모두 추억이 되어버렸습니다. My deepest condolences to Professor Kwack’s family and friends! To me, he was a generous and at the same time passionate scholar who never failed to impress me in expressing his views unequivocally about diverse issues that I needed some enlightenment. I trust that Dr. Kwack will be fondly remembered by many of us who have been touched by his energetic personality and leadership style as a president of KAEA during the formative years of our association. Your presence with us will be missed for long, Dr. Kack. Notwithstanding “at our age, anything can happen, anytime,” the demise under the circumstances of, Prof. Sung Yeung Kwack, a dear friend and venerable colleague, is particularly painful. His caring personality and tireless professional drive will be missed ever more with the passage of time. Int. Econ. J. and I owe a special (unpaid) debt to him. In the early days of the journal when the professional help and personal assurance were sorely in need, Prof. Kwack spared no effort to assist us in innumerable and invaluable ways. 곽승영 박사님의 갑작스런 별세를 너무 애통하게 생각합니다. 곽박사님은 늘 소탈하시고 검소하셨으며, 후배들과도 격의없이 어울리신 분입니다. 마음이 따뜻하시고, 삶을 즐기시면서도 연구와 학문에는 누구보다 강한 집념과 엄격함을 가지신 분이셨습니다. 특히 은퇴후에는 경제학 외에 정치, 인문학에 대한 많은 독서를 하셔서 그 분께서 한국사회에 대해 분석하시는 글이나 조언하시는 강연의 내용은 한국사회에 주옥과 같이 귀중한 것이었다 생각합니다. 얼마전 보내주신 메일에서 Potomac 댁에 채소 씨를 심으셨다는 말씀을 하셨는데, 이제 그 곳의 채소 밭도, 저희도 곽박심의 손길과 좋은 논문들을 더 이상 대하지 못해 너무 애통스럽게 생각됩니다. 늘 지으시던 웃음처럼 편하게 영면하시길 기원드립니다. 교수님이 타계하셨다는 안타까운 소식을 들었습니다. 몇년전 무더윘던 여름밤, 서울 강남의 시원한 주점에서 약주에 즐거이 취하셔서 한국의 경제학교수, KDI, BOK 및 정부 관료들의 여러가지 비화와 비사를 재미있게 이야기하시던 때가 기억납니다. Crew cut 머리 스타일에 지굿이 웃으시던 모습과 함께. “윤교수, 이제 한국경제문제를 좀 연구해 봐!” 말하셨던 것이 엊그제 같습니다. 경제 뿐아니라 세상 만사마다 확고한 자기 의견이 있으셨지요. 오늘의 흔한 경제공학자들 속에서는 찾아볼 수 없는 경제적 지혜를 갖고 계셨던 선배님께 자주 연락드리고 미리 조언을 구하지 못한 것이 후됩니다. May your journey to Eternity be blessed. With deep condolences to Professor Sung Y. Kwack’s family on the loss. I remember Professor Seung Y. Kwak as a scholar who was very goal-oriented for academic excellence, as reflected by his prolific publications and many lecture engagements. In addition to his scholarly activities, one of the less-known facts is that he was one of the key players in consolidating the foundation of the Korea -America Economic Association. I came to realize the success he achieved by his tireless efforts to raise endowment funds and to promote KAEA growth during his tenure as the President of the Association. He will be missed by many in the KAEA. Kwan S. Kim, University of Notre Dame.